"This research represents a significant breakthrough in the development of superior silk fibers for both medical and non-medical applications," said Malcolm J. Fraser Jr., a Notre Dame professor of biological sciences. "The generation of silk fibers having the properties of spider silks has been one of the important goals in materials science." The firm entered into a research agreement with Fraser, who discovered and patented a powerful and unique genetic engineering tool called "piggyBac". PiggyBac is a piece of DNA known as a transposon that can insert itself into the genetic machinery of a cell. "Several years ago, we discovered that the piggyBac transposon could be useful for genetic engineering of the silkworm, and the possibilities for using this commercial protein production platform began to become apparent." Fraser, with the assistance of University of Wyoming researcher Randy Lewis, a biochemist who is one of the world's foremost authorities on spider silk, and Don Jarvis, a noted molecular geneticist who specializes in insect protein production, genetically engineered silkworms in which they incorporated specific DNAs taken from spiders. 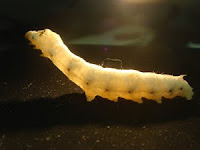 When these transgenic silkworms spin their cocoons, the silk produced is not ordinary silkworm silk, but, rather, a combination of silkworm silk and spider silk. The genetically engineered silk protein produced by the transgenic silkworms has markedly improved elasticity and strength approaching that of native spider silk. "We've also made strides in improving the process of genetic engineering of these animals so that the development of additional transgenics is facilitated," Fraser said. "This will allow us to more rapidly assess the effectiveness of our gene manipulations in continued development of specialized silk fibers." "Using this entirely unique approach, we have confirmed that transgenic silkworms can be a potentially viable commercial platform for production of genetically engineered silk proteins having customizable properties of strength and elasticity," Fraser said. "We may even be able to genetically engineer fibers that exceed the remarkable properties of native spider silk."